One Week Wonder: Performa 400 Paradise! After I started re-using my 14 year-old Macintosh Performa 400, I just can't help raving about it! If you've never heard of one, then it's worth taking a step back in time to 1993 for a recap. 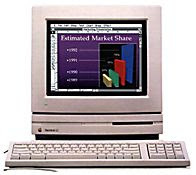 I started using Macs in 1986, 512K monochrome machines, but I couldn't afford to buy one until a year into my first proper job, in 1993. The best Mac I could sensibly get hold of was a Performa 400 - a 16MHz 68LC030 Mac with 4Mb Ram and a 40Mb HD, running System 7.1. It cost me about £1280 with a printer. Although slow even by those days it was fantastically versatile, I produce decently edited brochures; bought Think C and wrote some Mac Programs; I upgraded the memory to 8Mb; the Hard disk to 270Mb and I added a SCSI Zip drive and CD Rom. This was the machine that got me onto the internet in late 1995, early 1996 with Netscape 1.18 and Eudora 2.x for email. Since then I've gone through a number of Macs: A PowerMac 4400, a PowerBook 5300, a tangerine iBook, a 600MHz iceBook and now my two main Macs are the 12" PowerBook G4 I'm typing this on and an iMac G5. But I still love the P400, which I reacquired from my sister when they upgraded. It's great! For a start... it still WORKS! And with it's ethernet PDS card I can use an old web browser and also ftp. The neatest thing though is still Think C - it's about 17 years old, but as a programming environment, still much more productive than XCode. It's 1Mb of pure genius; efficient and highly usable for (really) basic stuff! And to think it's all being done on a 16MHz 68030, a cpu roughly 1000times slower than today's computers (over 200x slower than my G4), a cpu so primitive they wouldn't even put it in today's crummiest mobile phone!